There was standing room only for Chris Christie’s 15th Town Hall meeting, held at Salt Hill Pub in Newport on Tuesday. 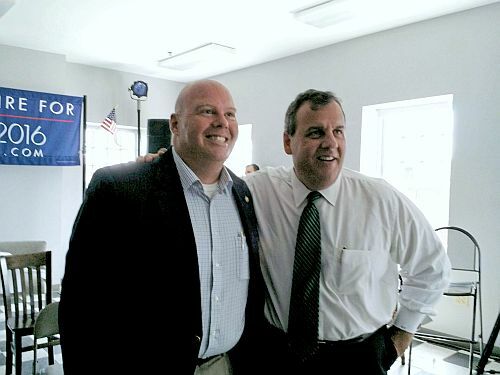 Christie addressed the crowd on National Security, States Rights, and Social Security. Christi said that 72 percent of the federal budget goes to entitlements compared to 26 percent when John F. Kennedy was president. According to the governor the federal government estimates that social security will run dry in 17-18 years, but Dartmouth and Harvard studies show it will be 7-8 years since the feds didn’t factor in a declining population growth and longevity. Christie took unscreened questions from the audience and Lempster Resident Kevin Onella, questioned Christie’s plan to means test social security for those whose retirement income is $200,000 a year or more. Christie said we inherited the social security problem from previous bad choices and both parties have failed to have this conversation. David Keith Named Sergeant for New London Police Department. David Keith has been named Sergeant for the New London Police Department. Keith has been an officer with New London for over two years and began his law enforcement career as a 911 dispatcher for the state of NH. Before coming to New London, Keith was a patrol officer in Maine for five years. David Keith fills the Sergeant vacancy left by David Zuger who was just sworn in as the new Wilmot Police Chief. The New London Selectboard unanimously approved the promotion at their Monday night meeting. Chester VT Firefighters and the Vermont State Police suspended their day long search for 57-year-old Lynn Perry about 10:30 last night. Perry walked away from her Andover residence sometime after midnight early Tuesday morning and Ludlow Fire, Weston Fire, Windham Fire and Londonderry Rescue assisted with a search for Perry. The search for the missing woman will resume early Wednesday morning with the assistance of the Proctorville, Springfield Fire and Ascutney Fire Departments. Chester Fire Department asks that people continue to spread the word of Ms Perry’s disappearance on social media. Ms. Perry is 5’05”, 140 pounds and has white hair; she was last seen wearing blue pajamas no shoes and carrying a red blanket. Sullivan County Attorney Marc Hathaway said speed was the major factor in the Unity Crash that killed three teens on August 10 of last year. An investigation revealed that the 1997 Saab 9000 was going 91 mph in a 40 mph zone before hitting a tree and killing Brandon Rock, Brittany Bailey, and Jonathan Varnum. Selina Currier sustained serious injuries. At the time Currier said she was driving, but an investigation by the NH State Police Collision Analysis and Reconstruction Unit (CAR) and the Sullivan County Attorney’s Office determined that Jonathan Varnum was the driver. The evidence showed that Brittany Bailey was seat belted in the rear driver’s side of the vehicle, Brandon Rock was seat belted in the front passenger seat of the vehicle. Selina Carrier was belted in the rear passenger seat established by Selina’s injuries. Also a video from the Wal-Mart parking lot tends to establish Jonathan Varnum was the driver of the Saab when it left parking lot at 1:44 am prior to the crash. Investigators said inconsistency in Selina’s statements are, attributed to confusion associated with trauma. There was no evidence of alcohol or drug use by Jonathan Varnum.